Heat loss or gain in a building can occur through Radiaiton Conduciton and Convection. Conduction through the building envelope accounts for most heat transfer. Heat gain due to conductin can be reduced (but not eliminated) by adding insulation. Convection by air leaks can and shouid be prevented by "tightening" the building. Radiation affects mostly glass surfaces and can be reduced by the use of reflective galss coatings. Heat transfer is often accompanied by mosture movement, since warmer air contains more water vapour than cold air. The movement of vapour does not coincide with the actual movement of the air containing it. When warm air cools down or meets a cool surface, it loses some of its moiture, producing condensation. The air temperature at whic condensation starts to occur is the dew point. Condensation may lead to metal corroision, growth of mold and mildew, loss of insulating properties, and rined finishes. It can be minimized by installing a vapour retarder on the warm side of surface (the side with the higher vapour pressure). Vapour retarders slow down moisture transfer towards a cooler surface. In winter months, the warm side is the inner surface of the wall. During hot summer months the warm side is the outside surface. Metal panels are virtually vapour impermeable and are excellent vapour barriers in hot weather conitions. It is cold weather condensation protection that is normally needed for interior surfaces. The Most practical & economical type of insulation for Pre-Engineered Steel Buildings is fiberglass insulation. 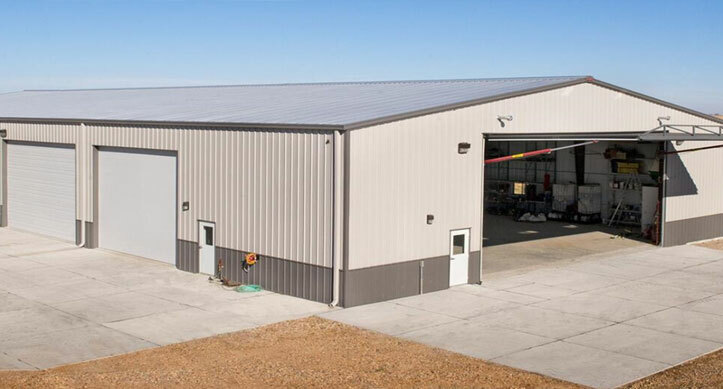 Is is recommended that the roofs and walls of Pre-Engineered Steel Buildings be insulated with fiberglass insulation that meets the following specificaitons. 2. Fiberglass insulation be available in densities of 10, 12, 16 and 20 kg/m3 in order to meet high thermal resistance "R" values. 3. The underside of the fiberglass blanket be laminated with a functional facing that can serve as an effective vapour barrier and a flame retardant. The two most recommended laminates are white metalized scrim kraft (WMSK) AND FIBER REINFORCED KRAFT (FRK). 4. The Underside laminate extends 50mm on each side of the fiberglass insulaton in order to achieve neat joints between insulation runs.